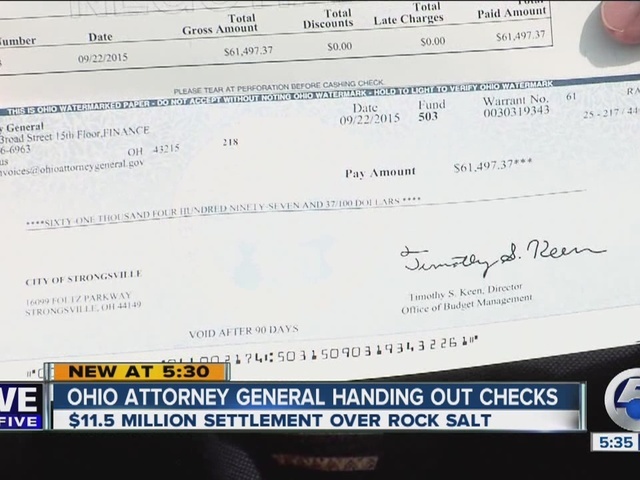 Attorney General Mike DeWine announced Thursday which local governments will get a share of Ohio's $11.5 million settlement with rock salt producers accused of conspiring to drive up prices. DeWine's office has said cities, townships and universities were among about 850 entities that filed claims. Of the total settlement, about $6.8 million was made available to local governments. Cleveland and Akron combined received nearly $400,000 today after Attorney General Mike DeWine resolved an anti-trust lawsuit against Cargill Inc. and Morton Salt Inc. Dewine claimed Cargill and Morton worked together in dividing up the state so that they would only bid on their decided-upon cities and not compete with each other. The companies admitted no wrongdoing but agreed to pay $11.5 million. VIEW the rest of the claims here. The settlement ends a lawsuit in which the state alleged that Chicago-based Morton Salt Inc. and Minnesota-based Cargill Inc. agreed not to compete with each other to inflate prices, leading to above-market prices for rock salt to de-ice roads and bridges. Both companies denied wrongdoing. Ohio public entities that bought salt from them between July 2008 and July 2011 were able to file claims.